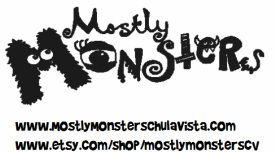 Mostly Monsters Chula Vista is a mom & daughter shop that specializes in cute and adorable handmade monster-themed items...guaranteed to make you SMILE! Our items are all MADE IN THE USA...in sunny Southern California- a great place to grow monsters. We do our best to use our own ORIGINAL patterns, artwork, and ideas so that you can rest assured that our items are unique. Our monsters are ready for immediate adoption, and typically ship within 24 hours (sometimes same day! ), & we welcome custom orders. We carry a variety of goods, and frequently change the list of available merchandise. *Faux Fur AVIATOR & MONSTER-FACE hats, complete with ears! *ZOMBIE BABIES Glove Dolls , made from re-purposed gloves! *CUDDLE MONSTER pillows & Pajama eaters, great bedtime buddies! *BEANIE MONSTERS, made of soft fleece in a variety of sizes. *NOMNOM Egg Monsters...fun to play with! 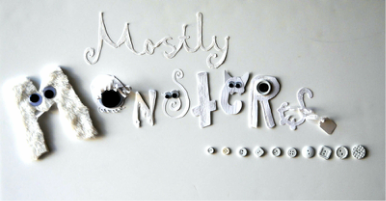 *KLEENEX KREATURES & KOZIES, monsters who love to protect your tissues! *Faux food, like felt donuts, Squeaky Eggs, and Toy Turkey Legs for dogs and cats! . *A variety of FELTIES, pins, and jewelry. *Hairibows, Bowties, and matching sets! *FUZZY EAR Headbands, for the look of an "ear hat" without getting overheated! *NEW! Fuzzy Clip-on TAILS to match your favorite fuzzy hat! Check our shop often to see what's new! We create new items daily, and list often! Seasonally, you may even find us around town at local Craft Shows, Fairs, and Festivals! Please see our "Amazing Shows & Awesome Events" page for details. AND we've even been interviewed on KUSI TV "Good Morning San Diego" with Brad Perry!